Some thoughts on public investment | This is Ashok. Edit: Dean Baker has some thoughts that echo my thoughts, perhaps in better words! After the heated debate between Joe Scarborough and Paul Krugman, Jeffery Sachs and Scarborough co-authored an op-ed in the Washington Post, contending that “Deficits do Matter“. Paul Krugman replied with some good points and asks Sachs, what exactly he considers “crude Keynesianism”. To this, Sachs wrote a well-thought editorial in the HuffingtonPost. I don’t think the attack on Krugman is fair – I’ll get to that later – but I also think Sachs’ argument fails to grasp the extent of cyclical (rather than structural) downturn, the extent to which ‘infrastructure’ can create immediate jobs, and external factors, like the European crisis. Ultimately, I think Sachs misrepresents his own (good) ideas under the guise of ‘debts are bad’. Infrastructure spending is smart, necessary and, yet, increases our structural deficit. Sachs is absolutely right that stimulus won’t solve long-term unemployment. Sweeping AS reforms, however, won’t be as quick to solve short-term unemployment. Skill atrophy will force long-term unemployment, in some measure, to be a function of short-term unemployment (though, WWII is a pretty good example to the contrary). There is no reason the US can’t both stimulate the economy with spending while at the same time overseeing broad, long-term, structural reforms. (4) The belief that “to a large effect, spending is spending,” thereby catering to waste and vested interests while ignoring America’s urgent investment needs. I believe that all of these positions are misguided. The belief in stable, predictable, and large multipliers is belied by both theory and evidence. Households and local governments might simply use a temporary tax cut or temporary transfer, for example, to pay down debts rather than to increase spending, especially because the tax cut or transfer is seen to be temporary. Businesses, concerned about the buildup of public debt, might hold back on business investment in the face of large deficits, anticipating higher taxes in the future. That families might use stimulus checks to pay down debts is incorporated into any calculation of a multiplier which is inversely proportional to the marginal propensity to save. Sachs might argue that the method in which multipliers are calculated is incorrect, which might well be the case, but is not in itself a criticism of Keynesian policy. The rational expectations argument has a lot of appeal, but is ultimately predicated on the idea that much of our deficits are structural. If deficits are primarily cyclical, a government can impose a one-time high tax that would have no effect on future investment (whether this is subgame perfect or not is another story). These structural components are not susceptible to a Keynesian diagnosis or to a Keynesian remedy. They require a long-term public investment response that has not been forthcoming. Second, Krugman seriously and repeatedly downplays these structural changes occurring in the U.S. economy. He repeatedly emphasizes that we suffer a demand shortfall, pure and simple, one easily remedied by more stimulus. Yet it’s increasingly hard to reconcile many features of the U.S. economy with this view. When we consider deficits as a proportion of potential GDP, the deficits are coming down. Sachs and Scarborough don’t acknowledge that CBO estimates a flat debt-GDP ratio over the next decade. 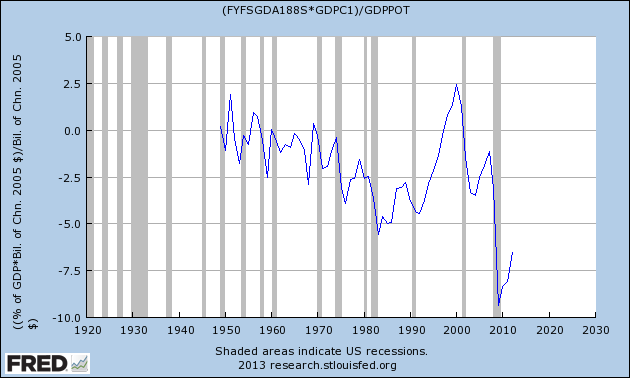 We have a long-run spending problem which, again, has nothing to do with a criticism of short-run stimulus. CBO budget projections are pretty accurate in the short-horizon, and at this rate cyclically-adjusted (or structural) deficits will fall below 3% this year. This is eminently feasible, at current growth rates. Third, crude Keynesians like Krugman believe that we don’t have to worry about the rising public debt for many years to come, perhaps well into the next decade. This is remarkably shortsighted. The public debt has already soared, from around 41 percent of GDP when Obama came into office to around 76 percent of GDP today (and with no lasting benefit to show for it). If Krugman had his way, and deficits were not restrained, the debt-GDP ratio would already be above 80 percent by now and would be rising rapidly towards 90 percent and above (as shown in the recent CBO alternative scenario). For one, ‘has increased’ is wildly different from ‘is increasing’ – not the least that the former is true while the latter is not. Furthermore, so long as growth projections outpace structural deficits, there isn’t something magical about a 90% debt-GDP ratio. Indeed, growth would have picked up faster, and fewer people would be unemployed, and even fewer permanently unemployable. A self-proclaimed progressive like Sachs should care about this. A lot. Most of the shortfall this recession has been due to demand-deficiency. While supply-side reforms are crucial, we’re not experiencing any severe cost-push inflation. We have time to implement a well-thought infrastructure plan that would invigorate our power grids in an environmentally and economically sustainable fashion. Further, Obama has tried to leverage global growth to the greatest extent he can. While Sachs might argue Krugman hasn’t ‘quantified’, the effect of the European crisis is pretty obvious. Sluggish European demand has widened our trade deficit and, for the first time, the greatest trade growth in developing countries has come from other developing countries. China is now the largest trade partner for most countries. It’s not as easy to ‘tap in’ to global recovery as it once was. Obama is pursuing a European free-trade deal that would hopefully spur job growth. Both the United States and Europe are in dire need for homogenized regulations, we have good reason to believe the President can pull this off. It’s true that we’ve not paid heavily so far for this rising debt burden because interest rates are historically low. Yet interest rates are likely to return to normal levels later this decade, and if and when that happens, debt service would then rise steeply, increasing by around 2 percent of GDP compared with 2012. Many people seem to believe that we can worry about rising interest rates when that happens, not now, but that is unsound advice. The build-up of debt will leave the budget and the economy highly vulnerable to the rise in interest rates when it occurs. The debt will be in place, and it will be too late to do much about it then. If a vedic astrologer told me that rates would be ‘normal’ later this decade I would be thrilled. It means businesses aren’t hoarding cash, private investment is increasing, unemployment is falling and, as automatic stabilizers start slowing, decreasing deficits. Alas, this is not the case. Markets are forward looking, and any expectation of future growth or rise in interest rates would result in a discounted increase today, which is not the case. Yields capture the macroeconomy. Furthermore, we’ve rolled over a lot of our debt on longer maturities. The effect of increasing yields will be slow to cause rising deficits. In fact, Krugman’s argument is highly consistent. If the economy is in the gutter, it’s okay to spend more. It’s a pretty terrible idea to run deficits when it’s expanding. Krugman isn’t arguing for structural deficits that outpace growth, only the need for cyclical stabilizers. This is both economically and morally sound. (3) Increased revenues through taxation on high net worth, financial transactions, high incomes, capital gains and carried interest, offshore corporate earnings, and carbon emissions, and a stiff crackdown on tax havens and phony transfer pricing. All of this would have been much easier if Obama had started down this long-term path in 2009, and had never conceded the permanence of the Bush-era tax cuts for almost all households. Instead, he followed a populist and shortsighted policy of “stimulus” and tax cuts. While most of the gains come 6-8 years after increase in investment, there is a not insignificant increase in immediate activity. Indeed, ARRA included just under $30 billion in highway grants. This approach is disastrous both politically and economically. Progressives like myself believe strongly in the potential role of public investments to address society’s needs – whether for job skills, infrastructure, climate change, or other needs. Yet to mobilize the public’s tax dollars for these purposes, it is vital for government to be a good steward of those tax dollars. To proclaim that spending is spending, waste notwithstanding, is remarkably destructive of the public’s trust. It suggests that governments are indeed profligate stewards of the public’s funds. However, as a progressive I ultimately disagree that short-term spending is misguided. 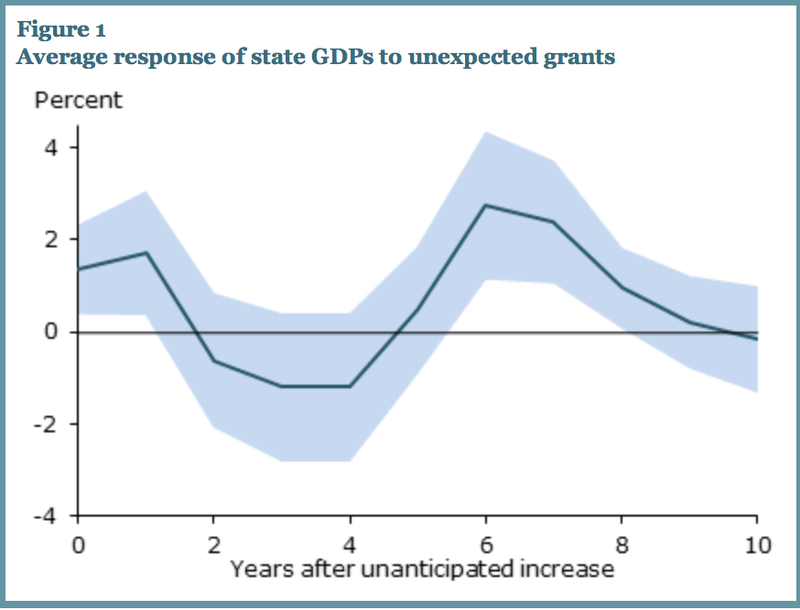 Much of the stimulus and cyclical deficit was directed in financing unemployment insurance and transfers for the relatively poor. By virtue of a flat dollar reimbursement and nature of the tax holiday, the largest beneficiaries of this scheme are those who earn the least. While Sachs approaches this spending from a merely artificial economic angle, there is a deeply human element, namely the funds provided by the recovery allowed many Americans to make end’s meet. This is a terrible way of achieving that necessary goal, but an important achievement nonetheless. Ultimately, all of Sachs’ great ideas will require us to run greater structural deficits. Official estimates suggest the US government can invest about $80 billion a year more on infrastructure and see positive gains. Do I think we should spend that much? Yes. I just don’t think it’s politically feasible without deficit spending. Unfortunately, Sachs can’t have the luxury of being both an advocate of public infrastructure and investment while simultaneously fearing our short-run deficit. What really depresses me is that after years of allowing high unemployment and low output to fester and calcify the supply side guys are going to win this debate. Well, there’s no reason we can’t have good supply-side policy (bridges, education, power grids, all that good stuff pundits like) and monetary/fiscal stimulus at the same time. I’ve pretty much given up on fiscal stimulus as an AD stabilizer. It will never be politically possible. MP is our only hope, and if the AS guys convince everyone there’s nothing to be done then…we’re screwed. Pingback: “Advocate Fiscal Policy, not Fiscal Stimulus” | It Don't Mean Much, These Seats are Cheap.